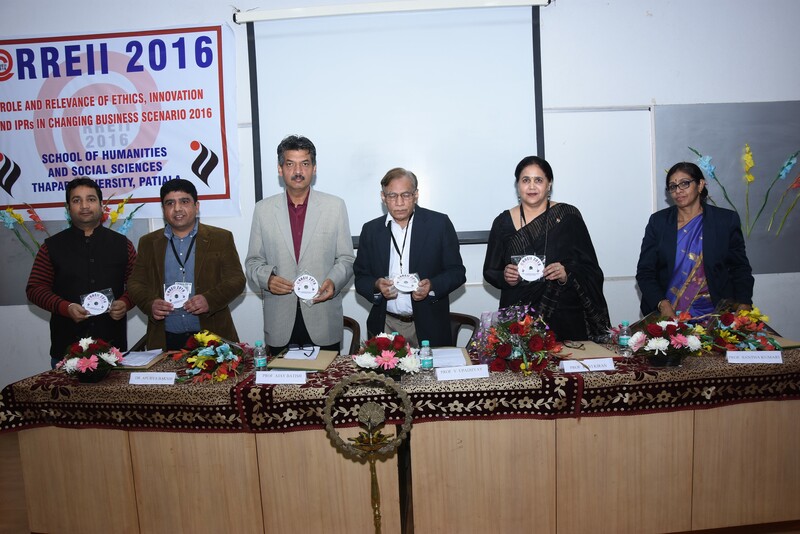 The International Conference on Role and Relevance of Ethics, Innovation and IPRs in Changing Business Scenario was organised by School of Humanities and Social Sciences on 16th-17th December, 2016 at Thapar University, Patiala. The conference covered the plenary talks by Prof Gunmala Suri, University Business School Panjab University, Chandigarh; Prof Rajender Kumar. Head, Dept. of Management Studies, NIT Kurukshetra; Dr Khushdeep Dharni, Panjab Agricultural University, Ludhiana. The topics covered Innovation in Business, Ethical Aspects of Intellectual Property Rights, Role of IPRS in Changing Business Scenario and Innovation and Problems in Startups by renowned academicians, Scientist from Punjab State Council of Science and Technology and Entrepreneur. The Chief Guest of the occasion, Professor V. Upadhayay from I.I.T. Delhi delivered the inaugural Address at 11 AM on 16th Dec. 2016. Professor V. Upadhayay highlighted the importance of Ethics, Innovation and IPRs in context of Globalised scenario. In view of demonetisation, innovation in alternate digital modes of payment and online payment applications gained further impetus. Skype talk by Professor Rakesh Belwal, Adjunct Associate Professor, UQ Business School, University of Queensland, Australia and Associate Professor, Faculty of Business, Sohar University, Sultanate of Oman and by Sanjay Gupta, CEO connecting Universe on role of ethics and innovation in education and emerging business was highly appreciated by delegates. The conference had three tracks of technical papers. The papers received covers academic ethics, Social Marketing and Ethics and Medicine Ethics, Innovation in academics, Finance and Business. It covers Intellectual Property Rights and the Position of Third World; along with Trademark Infringements in Consumers’ Apparels. 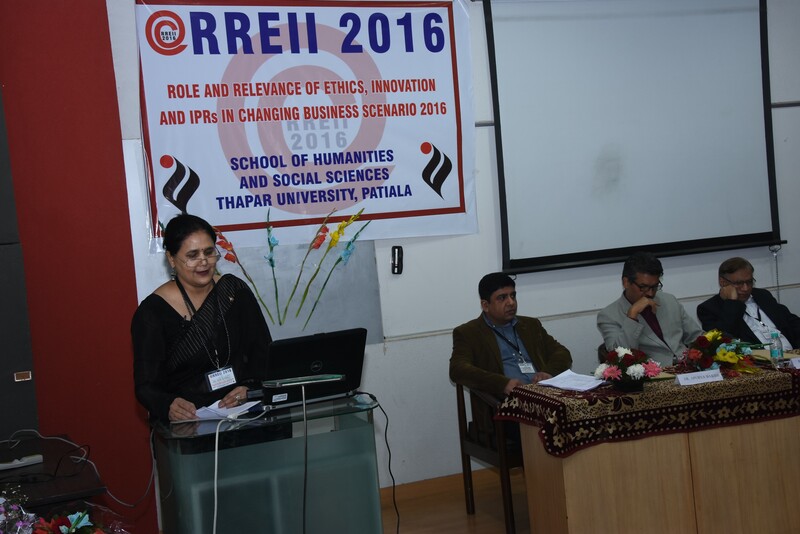 ICRREII-2016 provided a forum for researchers from academia and industry with an excellent opportunity to explore and share the advancements in the fields of Ethics, Innovation and IPRs. IPR being a key driver of growth in the current business scenario, salient aspects of intellectual property rights were discussed in the conference. The conference endowed participants with an opportunity to present and observe the latest research results, ideas, concepts and applications in the above-mentioned subject areas. TEQIP Sponsored Seminar on “Role and relevance of Ethics and Intellectual Property Rights in Changing Business Environment” was organised by School of Humanities & Social Sciences by Dr Ravi Kiran on September 24, 2013. In keeping with relevance of Ethics and Intellectual Property Rights in education the students the Institute organised plenary talks on Importance of Intellectual Property Rights in globalised scenario; Copyrights and Plagiarism issues, Ethical aspects of business in view of TRIPS and Stringent patent norms. The plenary talks were delivered by Prof Rajender Kumar, Head, Dept. of Management Studies, NIT Kurukshetra who is actively involved in IPR cell at NIT, Kurukshetra. Professor Sharanjit Dhillon of Guru Nanak Dev University enlightened the students on IPR status of developing economies. It was followed by interactive session where we had invited experts from Punjab State Council of Science & Technology, Chandigarh to answer queries raised by students regarding Patent Filing.